The San Francisco police telephone system dates from the nineteenth century, and was used extensively for patrol operations by the San Francisco Police Department until 1967 when portable hand-held radios were introduced. After the Great 1906 Earthquake, two Kellogg manual telephone switchboards were purchased  around 1913  by the Department of Electricity to replace the one that had burned at the Hall of Justice. One switchboard was installed at the new Hall of Justice, and the second was stored should another earthquake occur. When the Hall of Justice moved to 850 Bryant Street in the late 1950s, the second switchboard was brought from storage and installed on the fourth floor of the new Hall. It was this switchboard that ran emergency telephone communications in San Francisco for the three days after the 1989 earthquake. During the administration of Mayor Dianne Feinstein the old police "ring-in" telephone system was renamed "METS," which stands for Mayor's Emergency Telephone System. Its function in the 1970s was for emergency communications following disasters. It fully served its purpose during the 1989 earthquake, but was considered too antiquated for further use. Voters in 1990 authorized the Department of Electricity to purchase a digital electronic telephone switch and place it in the basement of the Central Fire Alarm Station on Turk Street. METS telephones are located in the homes and offices of City department heads, as well as all fire stations and police district stations. The lines for the system are installed and maintained by the Department of Electricity. The METS telephone system is also connected to the State of California's satellite telephone system for direct communication with the Governor's Office of Emergency Services in Sacramento, as well as the emergency operations centers of surrounding counties. 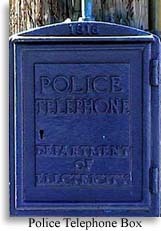 The old "police box phones" can still be found on San Francisco street corners, but they now contain METS telephones connected to Central Fire Alarm Station and the State's satellite emergency telephone system. Return to 1906 Earthquake and Fire Report.